New York University Press, 2000, 400 pp. For whatever happy reason, the past few years have yielded a bumper crop of excellent books on the history of paleontology. From Adrienne Mayor’s study of fossils in the ancient world (The First Fossil Hunters), to two books on the Cope-Marsh "bone wars" (Wallace 1999; Jaffe 2000), to Martin Rudwick’s translation of Cuvier’s key writings and Ellis Yochelson’s biography of Charles Walcott (with Volume 2 scheduled for release in March 2001), there has been no shortage of interesting books on the history of our profession. Add Paul Semonin’s American Monster to this list. American Monster chronicles the discoveries and interpretations of mastodon fossils in the United States, from colonial times to the mid-19th century. The bare outlines of Semonin’s history are simple and familiar. In the early 1700s, large teeth and bones were found in the Hudson River valley, in what was then the British colony of New York. Similar teeth and bones also turned up in present-day Kentucky, notably at the famous Big Bone Lick locality along the Ohio River. At first these were interpreted as the bones of giant humans killed in the Great Flood of the Biblical narrative. Later, the bones were reinterpreted as belonging to giant elephant-like beasts annihilated in some global catastrophe. Buffon described the bones; Cuvier used them to buttress the idea that extinctions had happened; Thomas Jefferson mused about the possibility that mastodons still survived in the unexplored northwest. Finally, around 1800, complete skeletons became available, and the American mastodon was more or less accurately reconstructed. This wouldn’t be a very long or interesting book if this were all that Semonin wrote about. But Semonin is trained as a historian, not a paleontologist, and thus doesn’t focus on the details of mastodon anatomy and taxonomy (although when he does discuss them, he does so accurately). Nor does he focus on the history of "purely scientific" controversies surrounding the mastodon—in fact, he shows that there were no such things as "purely" scientific controversies. What Semonin does is to flesh out his history with a wealth of detail, always explaining why the bones of the mastodon played the role that they did in the growth of American scientific thought and popular culture. As he writes, "At that time, there was far less distinction made between the worlds of science and those of religion, political philosophy, and economic thought, since scientific-minded persons shared the same nationalistic outlook with clergymen, politicians, and merchants." (pp. 292-293) He ends up covering topics from Thomas Burnet’s diluvialism, to the growth of "scientific racism", to the rise of naturalism in 18th-century painting. Some of this doesn’t have much to do with mastodons, at least not at first glance, and this gives the book a rambling feel in places. 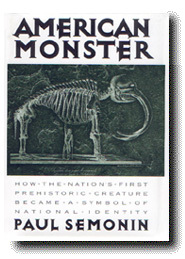 But Semonin’s central concern is not so much to chronicle paleontology per se—which barely even existed as a discipline at the time—but to show how the American mastodon figures in the greater picture of American intellectual history, and how the social, cultural, and scientific background of the times shaped the way in which Americans saw their "American incognitum." Semonin shows that the giant creatures of the past have always had a mythic dimension, and he chronicles the roots of the fascination that would later evolve into "dino-mania". Americans in the 18th century keenly felt that they had no glorious past in their "new world", no monuments comparable to those of ancient Greece and Rome. (The remains of the great Native American civilizations were either unknown at the time, explained away, or else simply ignored. Recognizing them would have interfered with the task of clearing the natives out of the way—heaven forbid that the heathen savages might actually have a legitimate claim to their own lands!) The mastodon bones that were found in America were used to fill this gap; they hinted at a grand and glorious heritage for the continent. Mastodon bones symbolized American pride: when Buffon wrote that North American mammals were small and inferior compared to European species, Thomas Jefferson cited the mastodon, in his Notes on the State of Virginia, as evidence that American animals were in every respect the equals of their Old World counterparts. Finally, the mastodon symbolized the savagery of untamed, primeval Nature, a concept whose roots Semonin discusses at length in Chapter 10. The mastodon was seen as a ferocious beast whose extinction foreshadowed the final conquest of the wilderness. Just as the "noble savages" were foredoomed to extinction by the inevitable progress of Civilization, so was the noble, savage mastodon doomed to extinction. In this light, it is no longer surprising that scholars made so many outlandish-sounding claims for the mastodon. George Turner, in 1797, speculated that flesh-rending mastodons, too bulky to chase their prey through forests and between trees, ferociously sprang from ambush upon hapless bison. Claiming that the beast bore enormous claws (which later turned out to be the claws of the ground sloth Megalonyx), he wrote, "With the agility and ferocity of the tiger; with a body of unequaled magnitude and strength, it is possible the mammoth may have been at once the terror of the forest and of man!" (pp. 309-310). In 1795, Dr. Samuel Mitchill creatively reworked some Native American legends and told of an evil spirit that had once brought "alarming droves of Mammoths, carnivorous animals, and especially loving to feed upon human flesh." (p. 294) John Filson, better known as Daniel Boone’s biographer, foreshadowed the blitzkrieg hypothesis for the Pleistocene megafaunal extinctions when he wrote that Native American tribes must have united to slay the awful monster: "To such circumstance we are probably indebted for a fact, which is perhaps singular in its kind, the extinction of a whole race of animals from the system of nature" (p. 200). Even Thomas Jefferson overestimated the mastodon’s size, at six times the volume of the living elephant. The widespread belief in the mastodon’s carnivorous nature caused Rembrandt Peale, who assembled and reconstructed the first complete skeletons, to turn the tusks so that they curved downwards, like enormous saber-toothed fangs. (Peale did later suggest that the mastodon might have used them to grub for shellfish and not to massacre other animals, except perhaps in self-defense.) There is a definite tall tale flavor to many of these stories; the mastodon sounds more than a little like Babe the Blue Ox. This is all very entertaining, but there is a sobering side to this history. We are not so different from the scholars of the 18th and 19th centuries. We still see our own societies, our own desires and dreams, reflected in the life of the past. Professional paleontologists may find that Semonin has raised an uncomfortable question: when we discuss issues such as whether T. rex was a predator or a scavenger, or whether or not human hunting caused the Pleistocene extinctions—what unspoken assumptions do we bring to the table? But the issues are greater than that: the early descriptions of mastodon fossils are bound up with the myths of Nature as fierce, bloodthirsty, but ultimately yielding to our rule. The view of the mastodon as the tyrant ruler of a savage domain was transferred to the growing number of "terrible lizards" and other "ruling reptiles" that began to turn up in the early 19th century. The very notion that it’s possible for "king tyrant lizards", "ruling reptiles", or any other organisms to literally "rule the Earth", repeated in a hundred popular books, has one root in depictions of the mastodon. The consequences of this idea are huge: if it is possible for one type of organism to "rule the Earth" and then be "dethroned", then it must be possible, even foreordained, for humans to conquer and rule all of nature, and dethrone anything in their way. If Nature is cruel, "red in tooth and claw", then humans are justified in being even crueler if necessary. The consequences of this view are obvious, from ecological destruction to genocide. Darwin is sometimes blamed for unleashing the "survival of the fittest" as a justification for racism, genocide, and imperialism—but Semonin reminds us that the roots of "social Darwinism" go back far before Darwin. Semonin ends his book by calling for the creation of new myths: new ways of seeing nature, not as a barbaric kingdom to be conquered, but as a diverse community which we have always been part of.